Find strength. Find love. Find hope. Discover the inspiring and unknown true story behind the beloved, chart-topping song I CAN ONLY IMAGINE. Directed by brothers Jon and Andrew Erwin (MOMS’ NIGHT OUT, WOODLAWN), the faith-based film beautifully illustrates that nobody is ever too far from God's love — or too far from an eternal home in Heaven. Bart Millard (J. Michael Finley) and his troubled father, Arthur (Dennis Quaid), share a tumultuous relationship. Early on, Arthur stifles young Bart’s dreams and pressures his imaginative son to follow in his footsteps. Bart obeys, until a football injury his junior year leads him to take a music elective. With encouragement from his teacher, Bart realizes he not only loves to sing, but he also has a gift. Though Arthur is not initially supportive of Bart’s newfound talent and passion, eventually he is touched by the gospel and changed by God’s grace. He begins to heal his relationship with Bart … before it’s too late. Interested in sharing the inspirational film with your church group? Learn more about our group ticket sales. I CAN ONLY IMAGINE is a gripping reminder of the power of true forgiveness and how our pain can serve a purpose. For Bart, the complex dynamic between him and his father inspired a song that impacted lives around the world. As the lead singer of Christian band MercyMe, Bart wrote “I Can Only Imagine” — the most-played radio single in Christian music history. You’ve heard the song. Now, hear the story behind its moving spiritual message in the film of the same name. Trace Adkins, Cloris Leachman and Madeline Carroll star alongside Quaid and Broadway’s Finley, who is making his screen debut. 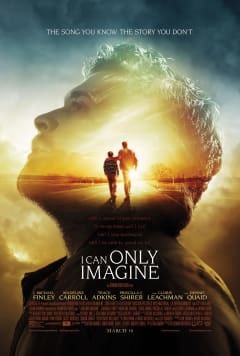 Tickets to I CAN ONLY IMAGINE are on sale now for the March 16 release. Get yours for you and your family today.